People tend to either love coffee or don’t have much to say about it. Could the addictive nature of the caffeine be effecting people differently? Are you someone who has it occasionally and forgets about it at times, or can’t you go on a holiday functioning without it? Determining where you are on the scale may give you a more accurate picture of how dependent you are. 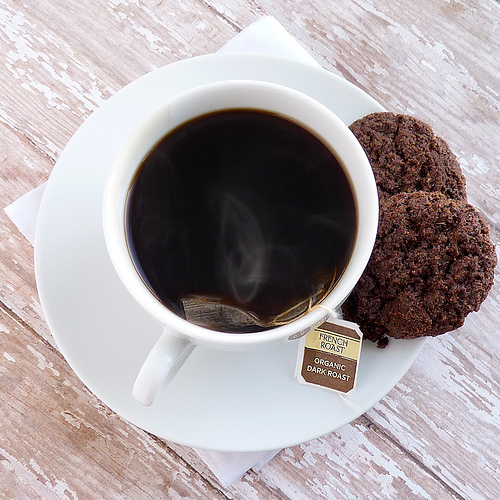 This is a rundown of the pros and cons of coffee plus a delicious herbal alternative. When I was 8, my grandma had a steaming cup of a dark, intriguingly aromatic substance and offered me a sip that I quickly spat out. Years would go by until we met again. My love affair with coffee started at the Bravo Café where I worked in my hometown in Michigan where pastries were abundant and the sweet smelled caramel and mocha lattes permeated my nasal passage. It was time to try coffee again. This time the bitterness was masked by sugar, milk and whipped cream. The synergy of bitter sweet melted in my mouth and I was instantly hooked. It was going to be a long affair – more than half my life before I realized it was time for a trial separation. Coffee is great once in a while for a pick me up. It is rich in cancer fighting antioxidants, just like wine and some studies have shown it to reduce the risk of Parkinson’s Disease. It gives you that little boost of energy with an exciting buzz that can last for hours. It’s great to enhance performance in races and tastes delicious. With this impressive portfolio it seems baffling why anyone would willingly choose to cut down or abstain from this substance. When is it time to kick your craving? The last comeback from my second relapse was uneventful. I was drinking one cup per day and nothing more. Then things got busy and stressful. I was feeling tired and rather than sleeping more, I decided to up my dosage. A few months went by and before I knew it I was drinking 4-5 cups per day. Was the double shot of espresso one or two cups of coffee? How many of those did I have? I lost count. My sleep was interrupted and I was getting overly anxious. I would come home from work in a nervous frenzy most days and began grinding my teeth. On particularly high caffeine intake days it took a while for me to wind down, even at 11pm when I had to work the next day. Additionally, I was feeling tired all the time with or without coffee. The exciting buzz was no longer there and it was time to cut down. Coffee is a stimulant that works by increasing excretion of cortisol, a stress hormone, from your adrenal glands. The adrenals are important for the fight or flight response. Think of someone running with extra speed from danger or superhuman strength during a stressful time, such as lifting a car to get a person out from underneath it. The adrenals are our friends but they can wreak havoc on your body when stimulated all the time. Continual stimulation may result in adrenal exhaustion. People with this suffer from hypoglycemia (low blood sugar), difficulty coping with stress and thyroid problems. Coffee depletes your body of calcium, potassium, magnesium and zinc. Hidden calories are also added if you have it with sugar, milk and other additives such as, syrups and whipped cream. All of my attempts to quit coffee have resulted in relapse. I cannot promise that you won’t find me ordering a cappuccino or three but I will always strive for if I can help it. One of my favorite coffee substitutes is for example Teecchino. It is a caffeine free, aromatic coffee substitute that is brewed just like regular coffee. It is delicious and almost as good as the real thing. It comes in vanilla, hazelnut, almond amaretto, java Mediterranean and chocolate! With all these delicious flavors I never get bored. Whether you are a coffee, tea or Teecchino drinker, moderation is always best at the end of the day. Never heard of Tecchino – where to you get it? I’m a decaff drinker, but this might be better!! Wow! Interesting article and easy to read during my busy day. I never realized how addicted to coffee I have become. I will take a page from your book and lessen the coffee drinking. Of course a healthy substitute will be necessary in my case…I don’t do well with “quitting cold turkey.” The idea of Tea and this new idea of “Teecchino” sounds interesting..I’ll give it a try.